We can boost your income with no effort on your part by creating a high quality mobile website based on your desktop site that engages & leads prospects rather than losing them to visit someone else’s that is less struggle than yours to navigate on their phone. Picture all these red-hot fully qualified prospects who are ready to do business with someone right now. Ask us to prioritize your job today before you lose any more thousands. are made on mobile devices? A dedicated mobile website is the easiest quickest and cheapest way to make a noticeable improvement to your web traffic. 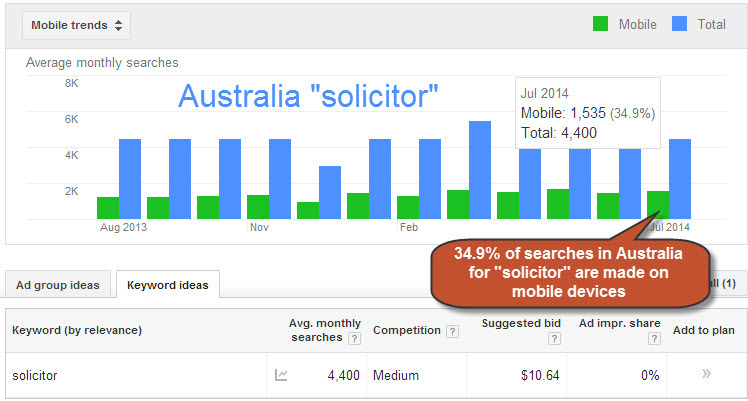 34.9% of Google Australia searches for ‘solicitor’ are performed from mobile devices. See other keywords below. Even in 2012 57% of consumers said they would not recommend a business with a poorly designed mobile site. Similarly, 40% of consumers will go to a competitor’s site after a bad mobile experience (Source: Compuware, 2012). 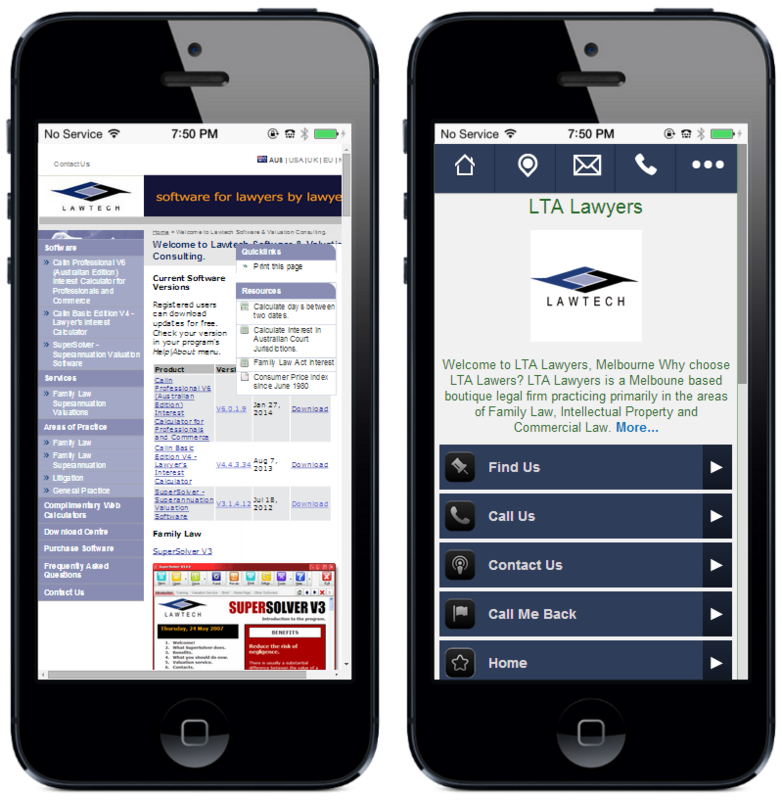 Your new mobile website is optimised to put all the important expected links on the home page. Its main purpose is to provide rapid home page navigation but it also captures much of your existing site as a bonus. Use your current domain name with code we supply to seamlessly redirect mobile visitors to the mobile site that we separately host. Even if you have a “responsive” website that adapts its layout to match a small form-factor it does not put all the key information in easy reach and is therefore no match for the dedicated mobile-website which does. Enter now for daily draw of a free interactive preview site worth $67. See full presentation below the fold. Enter the Order Number you were given by mail if you already have a site preview. Optionally allow an emailed request for an appointment – easy for them to commit. Want to see a live preview? We will create a live preview for you. The price will be credited to your purchase, or refunded immediately if you are not happy with the result – we think that is highly unlikely. better than any self-serving words that you are a good client-focussed business. 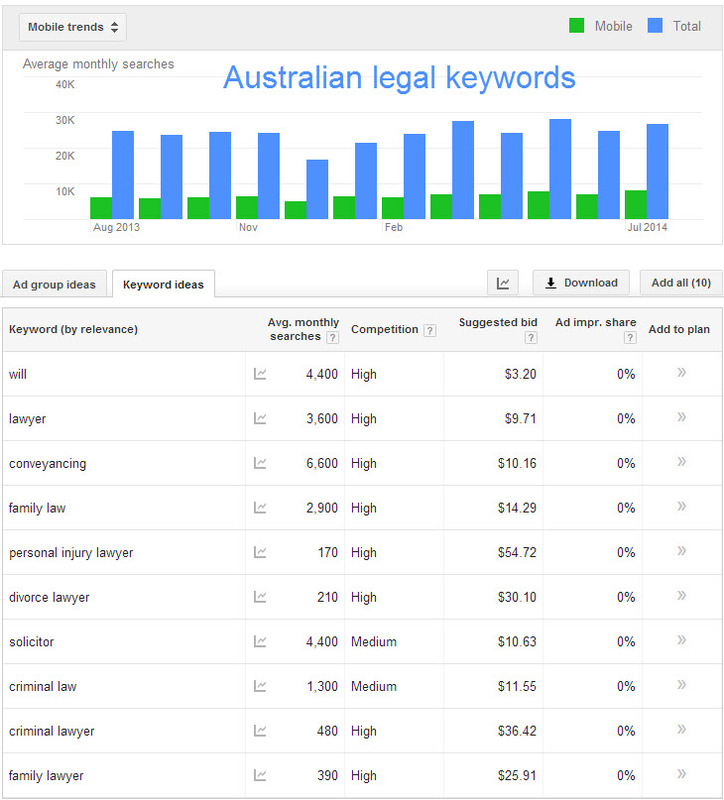 Here are some other current Google statistics for some relevant law related search terms in Australia. The graph shows the number of searches per month for mobile (green) and non-mobile (blue) devices. How many extra customers and clients will it take to pay for this investment? Can you really afford not to? Contact us and we can quickly implement this obvious improvement for you. This offer is strictly limited by time and number of customers in celebration of the opening of our new website & services & the release of Calin Version 7. Existing Calin users will be immediately upgraded at no extra cost, & the time added to their licence. Standard Website, hosted for 12 months. We provide diversion code from main website. 2 Years hosting mobile website, plus six free updates and two years of Calin Elite. Contact us if you require an instalment plan. Want to see alive preview? We will create a live preview for you. The price will be credited to your purchase, or refunded immediately if you are not happy with the result – we think that is highly unlikely.